There's a lot to admire about Shaun Garcia. Not only is he the Executive Chef at Soby's in Greenville, South Carolina, he's also the guy behind these gorgeous leather pieces. As he told me at his house the other day in Spartanburg, "Everything I've made, I've taught myself how to do. It's trial and error and I work at it till I get it right." When I asked Shaun what inspires him, he said, "The loss of the American worker." Shaun grew up in Startex, South Carolina where his dad, great grandfather and uncles worked in the cotton mills. Shaun adds, "Every area of the South had its own cotton mill. We were the epicenter of cotton and textiles for many years." Shaun not only watched his dad lose his job at the mill, he also saw the mills closed and torn down, as if they never existed. 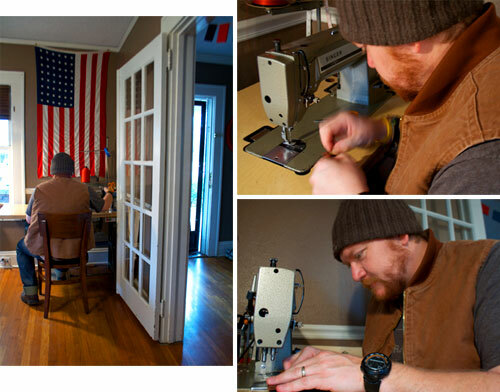 Shaun is inspired by the American workers of years past and is motivated by their efforts to use his own hands in labor- sewing, crafting, cooking, creating...and always with the highest level of skill and respect for the job at hand. His wallets (average price $30) differ in design and can be customized to the needs of the client. Shaun taught himself how to sew and his perfectionist side keeps him tweaking and trying until he gets each piece exactly as he wants. 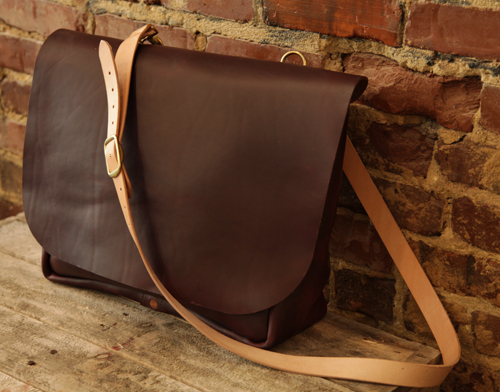 He loves the challenge of a new idea and I especially liked his leather portfolio, above. The gorgeous Carolina Brown leather, which he purchases from the Horween Leather Company in Chicago, (which in itself takes a month to produce) is so rich in color, smooth and soft. When you purchase one of Shaun's pieces, you are holding something that has been built to last..to care for and pass down to your kids. 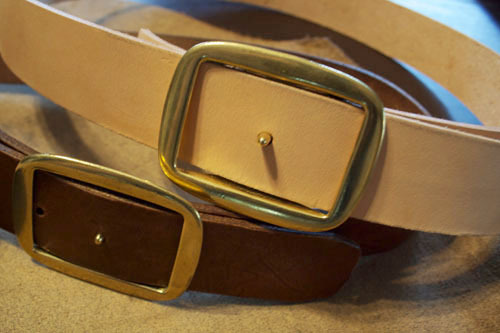 These belts are expertly made with a simple yet handsome design. Shaun utilizes the Conway Buckle, which allows the wearer to adjust the belt from the inside. 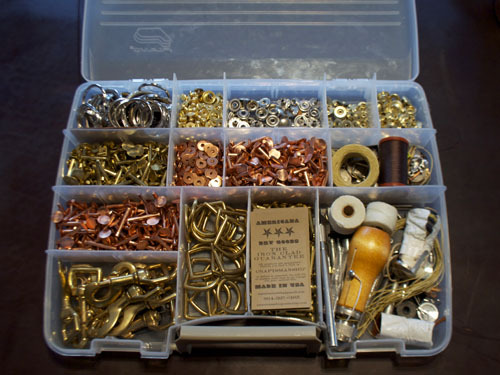 The belts come with two buckles; stainless steel and solid brass. You may remember Shaun's gorgeously made mailbag from last week's post. John Rich of Oakleaf and Acorn picked it as one of his Top Six Men's Gifts for this holiday season. It's what led me to Shaun and I was happy to see he has been inspired to build upon his success. First the mailbag... then wallets, portfolios, aprons, key chains...and now he has dreams of making his own pair of jeans. If anybody can figure it out, it's Shaun. 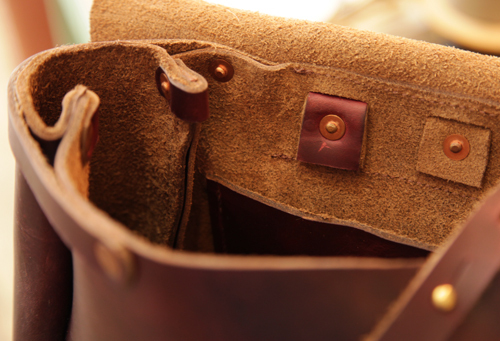 The quality of his goods is immediately apparent in the details- from the shiny brass tack to the perfectly placed rivet. Shaun revealed his greatest satisfaction, "When I make something and it makes my customer happy." All of his work, via his Americana Dry Goods shop, has an ironclad guarantee. As he says, "I will always stand behind my craftsmanship." I like what Shaun is doing. I like that he cares about making things with his hands; about high quality, care, respect and hospitality. He's the modern day American worker and it feels good to know the legacy of his family continues on...and inspires the rest of us. **To request your own leather item from Shaun, just send him an email, he'd be more than happy to hear from you.